"We've taken two proteins that normally have nothing to do with one another, spliced them together genetically and created a fusion protein in which the two components now 'talk' to one another," said Marc Ostermeier, assistant professor in the Department of Chemical and Biomolecular Engineering at Johns Hopkins. "More important, we've shown that one of these partners is able to modulate or control the activity of the other. This could lead to very exciting practical applications in medical treatment and bio-sensing." 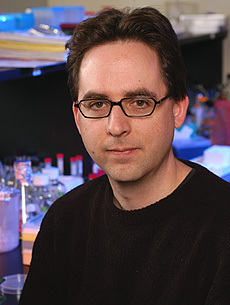 Marc Ostermeier is an assistant professor in the Department of Chemical and Biomolecular Engineering. Using a technique called domain insertion, the Johns Hopkins researchers placed beta-lactamase genes inside genes for maltose binding protein. To do this, they snipped the maltose binding genes, using enzymes that act like molecular scissors to cut the genes as though they were tiny strips of paper. A second enzyme was used to re-attach these severed strips to each side of a beta-lactamase gene, producing a single gene strip measuring approximately the combined length of the original pieces. This random cut- and-paste process took place within a test tube and created hundreds of thousands of combined genes. Because the pieces were cut and reassembled at different locations along the maltose binding gene, the combined genes produced new proteins with different characteristics. Ostermeier believed a very small number of these new fusion proteins might possess the molecular switch behavior he was looking for. To find them, he and Guntas took a cue from the process of evolution or "survival of the fittest." By looking for the E. coli that thrived in maltose, they could isolate only the ones in which the maltose binding partner was still active (in other words, it still bound itself to maltose). By mixing them with an antibiotic, the researchers could find the ones in which the beta-lactamase remained active and capable of reacting against the antibiotic. Through such survival tests, the researchers ultimately were able to find two fusion proteins in which not only were both proteins still active, but in which the presence of maltose actually caused the beta-lactamase partner to step up its attack on an antibiotic. 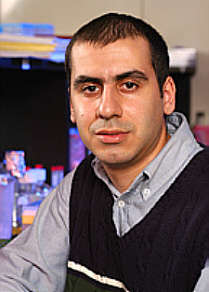 Gurkan Guntas is a doctoral student in the Department of Chemical and Biomolecular Engineering. "In other words," Ostermeier said, "one part of this coupled protein sent a signal, telling the other part to change its behavior. This is the first clear demonstration that you can apply the domain insertion technique to control the activity of an enzyme. If we can replicate this with other proteins, we can create biological agents that don't exist in nature but can be very useful in important applications." 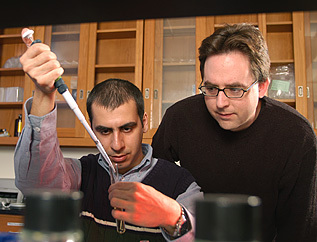 The Johns Hopkins University has applied for U.S. and international patents related to Ostermeier's molecular switch technology and the techniques used to produce them. Ostermeier's research has been funded by grants from the American Cancer Society and the Maryland Cigarette Restitution Fund. Color photos of the researchers available; Contact Phil Sneiderman.